"If today's Arab anti-Israeli and anti-Jewish propaganda strongly resembles that of the Third Reich, there is a good reason." So writes Joel Fishman of the Jerusalem Center for Public Affairs in "The Big Lie and the Media War against Israel," an insightful piece of historical research. Fishman begins by noting the topsy-turvy situation whereby Israel is perceived as a dangerous predator as it defends its citizens against terrorism, conventional warfare, and weapons of mass destruction. A 2003 survey, for instance, found Europeans seeing Israel as "the greatest threat" to world peace. How did this insane inversion of reality – the Middle East's only fully free and democratic country seen as the leading global menace – come to be? Fishman's answer revisits World War I, which is not a surprise, as post-cold war analysts increasingly recognize the extent to which Europe lives still under the shadow of that disaster, whether in its renewed policy of appeasement or its attitudes towards its own culture. Back then, the British government first exploited advances in mass media and advertising to target both the enemy's and its own civilian populations, hoping to shape their thinking. The Central Powers' publics heard messages designed to undermine support for their governments, while Entente publics were fed news reports about atrocities, some of them false. Notably, the British authorities claimed that Imperial Germany had a "Corpse Conversion Factory" (Kadaververwerkungsanstalt), that plundered enemy dead soldiers' bodies to produce soap and other products. After the war's conclusion, when the British learned the truth, these lies left a residue of what Fishman calls "skepticism, betrayal, and a mood of postwar nihilism." Second, Hitler admiringly noted the British precedent in his book, Mein Kampf (1925): "At first the claims of the [British] propaganda were so impudent that people thought it insane; later, it got on people's nerves; and in the end, it was believed." A decade later, this admiration translated into the Nazi "Big Lie" that turned reality on its head, making Jews into persecutors and Germans into victims. A vast propaganda machine then drummed these lies into the German-speakers' psyche, with great success. The defeat of Germany temporarily discredited such methods of inverting reality. But some escaped Nazis carried their old antisemitic ambitions to countries now at war with Israel and attempting to murder its Jewish population. Thousands of Nazis found refuge in Egypt, with smaller numbers reaching other Arabic-speaking countries, notably Syria. 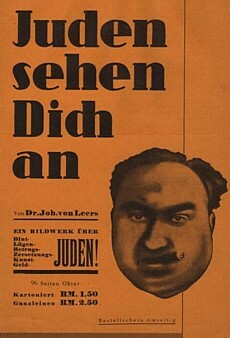 One of Johann von Leers' antisemitic tracts, Juden sehen dich an (lit. "Jews are watching you" but here meaning more "Jews are looking you in the face"). Fishman examines particularly the case of Johann von Leers (1902-65), an early Nazi party member, a protégé of Goebbels, a lifelong associate of Himmler, and an overt advocate of genocidal policies against Jews. His 1942 article, "Judaism and Islam as Opposites," lauded Muslims for their "eternal service" of keeping Jews "in a state of oppression and anxiety." This von Leers escaped Germany after 1945 and a decade later turned up in Egypt, where he converted to Islam and became political adviser to Nasser's Department of Information. There, Fishman recounts, he "sponsored the publication of an Arabic edition of The Protocols of the Elders of Zion, revived the blood libel, organized anti-Semitic broadcasts in numerous languages, cultivated neo-Nazis throughout the world, and maintained a warm correspondence encouraging the first generation of Holocaust deniers." Such groundwork proved its value after Israel's historic victory in the Six Day War of 1967, a humiliating defeat for both the Soviet Union and its Arab allies. The subsequent Soviet-Arab propaganda campaign denied Israel the right to defend itself and inverted reality by relentlessly accusing it of aggression. Precisely as Hitler had analyzed in Mein Kampf, if these impudent claims were at first thought insane, in the end they were believed. Today's political madness, in other words, is directly linked to yesterday's. Might some of today's anti-Zionists be ashamed to realize that their thinking is, however repackaged, but an elaboration of the genocidal deceptions espoused by Hitler, Goebbels, and Himmler? Might they then abandon these views?